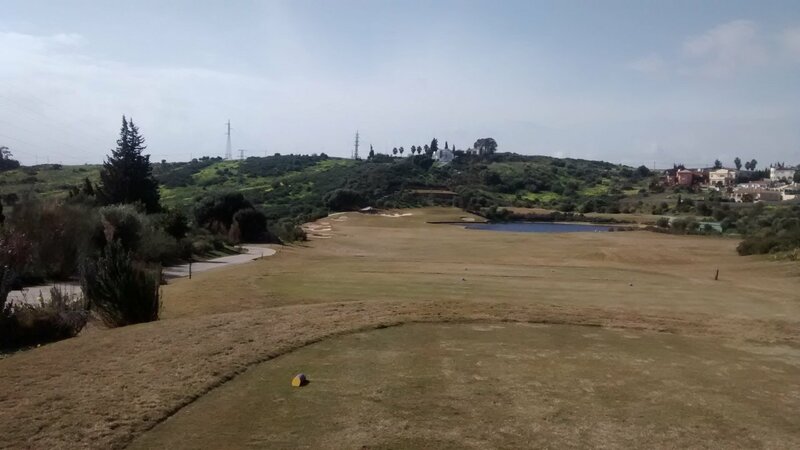 This golf club is just west of the town of Estepona, which is a slightly down-market area. The big property developments around Estepona reflect the 'high tide' of the Spanish property boom. When the tide went out with the property bust, the developments around Estepona were hit hard. So it is with the property surrounding the Valle Romano club and course. Also the road leading up to the club from the main coast road (A7, N340) is fairly patchy. Nothing the club can do about that – the local government simply no longer has the money to maintain all roads in good state. Let none of the above put you off visiting this golf course. It is very good indeed and well worth a trip. None of the property surrounding Valle Romano intrudes close to the course, so does not affect your round. The clubhouse is large and comfortable with plenty of parking. The whole area is quite open. Few large natural trees for example. So good clear views down to the sea a few kilometers away. Staff I found friendly. The course is quite widely scattered – only a few holes have another fairway alongside. The course is moderately up-and-down (along the fairway towards the green), but nothing scary. The buggy paths are in excellent condition. This is not a course I personally choose to walk because some buggy paths between holes are quite steep. You might want to try walking, but I suggest only after taking a buggy first time out. Fairways are consistent generous width on all holes. Not particularly wide, but certainly not narrow enough to represent a tough challenge to any golfer. The fairways are gently undulating, only 2 or 3 with really severe slope left-to-right or vice versa. The quality of the fairways is really very good. The grass on them is excellent. The tee-boxes are managed as extensions to the fairways, so the grass there too is good. Tee-boxes are the least important surface on any course, so even expensive golf courses sometimes compromise on the quality of the tee-boxes. But not Valle Romano. There are quality carved wooden hole maps on every tee. Virtually no blind holes either, so no excuse for 'I did not know where I wanted to aim my shot'. The first-cut rough just off the fairways is soft fluffy grass – quite common on courses down here. Your ball can sit down in that rough and the grass can grab your club. You usually require a strong shot to get out of it e.g. chop down behind the ball. Some areas just off fairways are planted sparsely with small shrubs and spiky bushes in a non-grassed area. Most of the time you can wander around in there and have a reasonable chance of finding your golf ball. There is no true rough (grass say a foot tall) on this golf course. Some holes have steep slopes running away from them, but you have to be quite wild or get an unlucky bounce off a buggy path to lose a ball down a severe slope. There are an average number of bunkers – all shallow and with high-quality fine sand. The bunker placements are fair but not notably tough. The greens are equally good. Not lightning fast like some really top courses, but certainly fast enough for it to be very easy to slide a putt several meters past the hole. Greens gently sloped and large, soft and hold the ball well. The grass on the greens is very good and consistently finely mowed. The green surrounds on this course are quite small (typically only 1 meter off the green), but are again consistently mowed and nice to pitch off. All of this review so far is very positive. Exactly so. 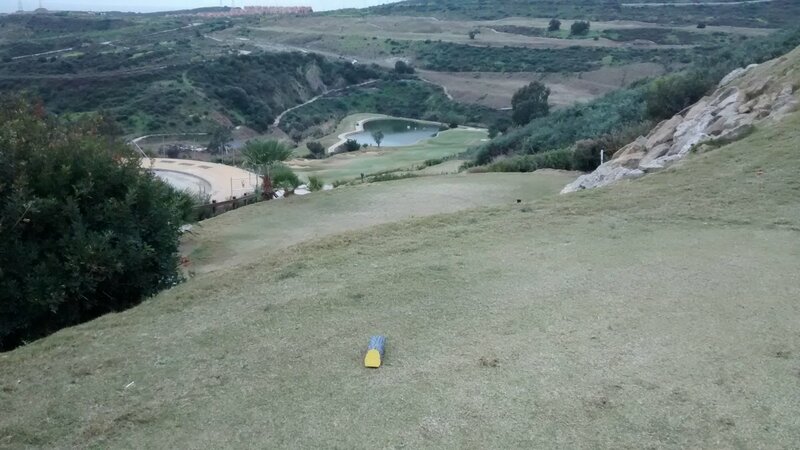 I think Valle Romano golf course is outstanding quality for its price level. In 'top 5' on the whole Costa del Sol in terms of value-for-money in my opinion. I can not think of a single thing to criticise on this course. 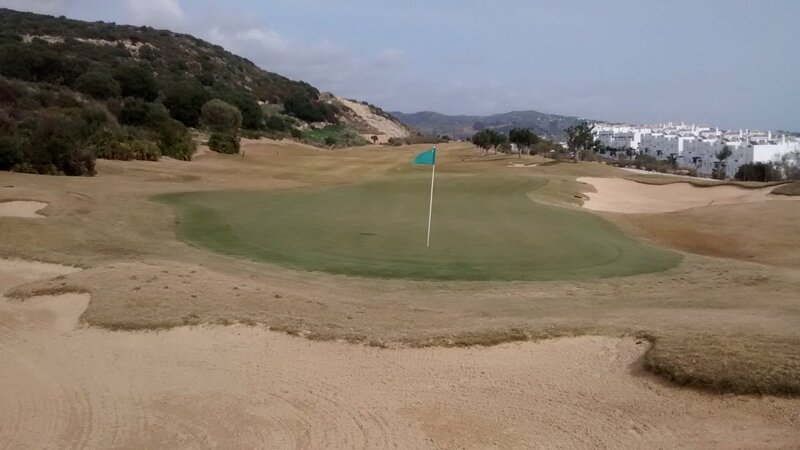 Even the maintenance at Valle Romano is careful and caring: Some examples: 1) divots are really well repaired (obviously done by staff rather than players), 2) the greens have no pitch marks at all that I can see. This course is in good consistent condition throughout the year – unlike some courses on the Costa del Sol that are in notably poorer condition during the Winter months. This course has not decided to compromise obviously in any way with the economic slump. So who do I recommend Valle Romano to ? Well, everyone up to 30 handicap. Above that handicap this course might be a little bit too tough. Players at all levels are going to find the racy greens a good challenge. Players up to 15 handicap are not going struggle here and playing to their handicap should not be tough. That is, most hazards will not really be an issue. Fairways are wide enough, and greens receptive enough for 'go-for-it' golf if your handicap is less than 10. This is an ideal course for a touring group of players on mixed handicap to visit: the course is good enough to provide something of interest to all handicap levels, and in good enough condition that no player is likely to find fault with anything on the course itself. A really nice course that simply feels 'loved and cared for'. Recommended. One I certainly want to go back to so I can get to know it better and play it to my ability. Review last updated: August 2015. Number of times played: 7. Valle Romano is represented by the yellow dot. This shows the course is about average difficulty and slightly more than average length compared to all other courses on the Costa del Sol. An 18-handicap player can expect to go around this course in 20 over par.